To Unfurl Your Wings and Fly! and would like to express it, you are probably a human angel. It is time to open your heart. I hope you join me on this journey Home. After 20 years of connecting with the angelic realm and facilitating over 8000 angel readings and hundreds of angelic energy healings, I am excited to offer you a simple yet powerful experiential Angelic Ascension program designed to support you to uncover your true birthright, shift your limitation of the physical 3D world and live as you were meant to be – free! 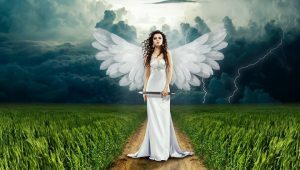 I have put together a simple yet powerful 8 part experiential angelic transformation program that will assist you in living as a human angel on Earth. This idea was sparked by a conversation I had once with Toltec author Don Miguel Ruiz who wrote the book, The 4 Agreements. 15 years ago, I interviewed him for my radio show The Namaste Show: Good News For A Change airing on CKCU FM. He said we are all physical angels. This idea struck me and stuck with me all this time. After years of answering the question how, I came up with a program showing you just that. It is simple yet effective. The program focuses on tangibly felt experiences using sacred ceremonies and angelic frequencies of transformation. We use the over arching map of the Sacred Seven – seven Mighty Elohim, seven Arch Angels, seven sacred rays, seven sacred elements and the seven sacred directions to help us personally shift, elevate and evolve. Who Is Ready To Fly With Me? Meet Your I AM Presence / Soul in the upper world of creation with the help of Arch Angel Uriel and the Crystal White Ray to be counselled, guided and directed from your Soul to your Self. Can’t make this date? Please PM me. We already have 2 participants that will be busy so I’ll be hosting a weekend catch up mid October. If you want in on the program, we’ll make it happen! I was Ottawa’s First Angel Therapy Pracitioner certified by Doreen Virtue working in Ottawa and one of the world’s Top Integrated Energy Therapy Master-Instructors. I am a Professional Spiritual Teacher and Transformation Specialist and a graduate of The 8th Fire School of Shamanism. I hosted “Jen’s Zen” tv on Rogers 22 for 2 years and “The Namaste Show: Good News For A Change” for 12 years on CKCU FM radio. I have had the honor of facilitating over 8000 one on one sessions for children, teens and adults who seek to reach higher. Obviously, this is not for everybody. The ideal participant is ready to reach higher. They are ready to change. He/she is most likely already a closet human angel of some kind. He/she is probably already a kind of spiritual warrior taking action for themselves and for others in their own life but desiring more peace, flow, harmony, ease and grace.He or she is probably already spiritually inclined, searching for answers and has an affinity or respect for angels. However, no experience is necessary. The class is open to anyone 16 years old+ who has an open mind and willing heart. This in fact is a great class for our conscious youth. So, who is ready to fly with me? Any questions, please PM me!